Rep. Michael Grimm speaks at a press conference after leaving federal court in April 2014. 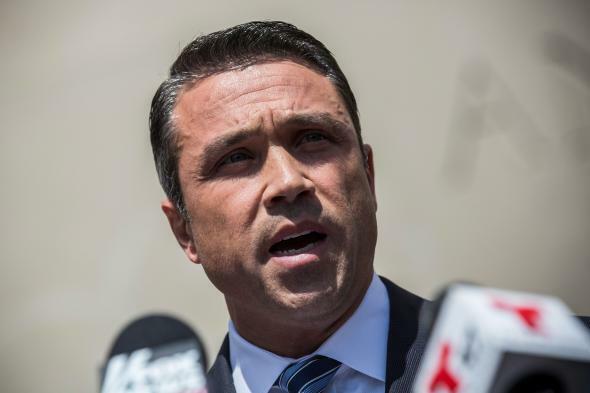 New York Rep. Michael Grimm announced Monday evening he will resign from office a week after the Staten Island congressman pleaded guilty to a felony tax charge. Grimm announced in a statement he will leave office on Jan. 5. “I do not believe that I can continue to be 100 percent effective in the next Congress, and therefore, out of respect for the Office and the people I so proudly represent, it is time for me to start the next chapter of my life,” Grimm said in the statement. Grimm’s departure, after winning a third term in November, brings an unexpectedly quiet end to his tenure in office. (As a frame of reference, Grimm once threatened to throw a reporter off a balcony in the Capitol building.) The GOP’s lone representative from New York City in the House had promised to fight to keep his seat despite admitting to a felony tax charge. Grimm ran for reelection in his Staten Island district despite a 20-count indictment hanging over his head stemming from a health food restaurant, Healthalicious, he owned and operated before serving in Congress. Despite vowing to continue in Congress, Speaker of the House John Boehner seems to have persuaded Grimm to step aside. Or as the New York Times (diplomatically) puts it: “Mr. Boehner appears to have done what a midterm election, constant ridicule in the news media and a guilty plea in federal court in Brooklyn could not: persuade Mr. Grimm to go away.” “House rules dictate that a member convicted of a crime for which a prison sentence of two years or more may be imposed should not participate in committee meetings or vote on the floor until winning re-election,” according to the Times. “The stricture could have left Mr. Grimm’s 11th district effectively disenfranchised until 2016.” Grimm’s seat will be filled via special election. Correction, Dec. 30, 2014: This post originally misstated that John Boehner is the House Majority Leader. He is the Speaker of the House.